Making learning fun isn’t a problem for children’s author Ross Burach! 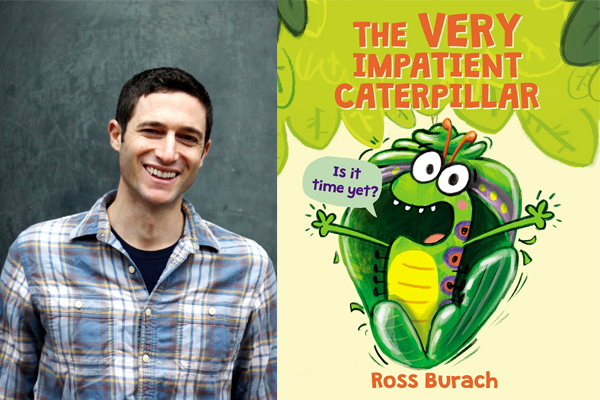 In his newest picture book, THE VERY IMPATIENT CATERPILLAR, Ross hides the science of metamorphosis inside the story of caterpillar who just can’t wait to become a butterfly. With bold, quirky illustrations and silly characters, THE VERY IMPATIENT CATERPILLAR is sure to bring a grin to all readers. Come metamorphosize (and laugh!) with us as Ross reads his new book and signs copies! This clever send-up of every child's biggest challenge -- being patient! -- is a STEM-friendly, laugh-out-loud comedy about metamorphosis. Ross Burach loves drawing pictures, making up jokes, dabbling in animation, and hanging out with his family. He is the creator of the picture book THE VERY IMPATIENT CATERPILLAR, which earned a starred review from The Bulletin of the Center for Children’s Books, the acclaimed picture book TRUCK FULL OF DUCKS , as well as the interactive board book HI-FIVE ANIMALS!, which was named the best board book of the year by Parents Magazine. Ross's work can also be seen in Jennifer Hamburg's BILLY BLOO IS STUCK IN GOO, a Children's Choice Book Award finalist, hailed by Publishers Weekly as a "high-energy cartoon that looks as though it sprang directly from a child's imagination." Ross lives in Brooklyn, New York. You can visit him online at rossburach.com.